PUTRAJAYA: The Immigration Department has this week crippled two syndicates specialising in producing fake Temporary Employment Visit Pass (PLKS) stickers. 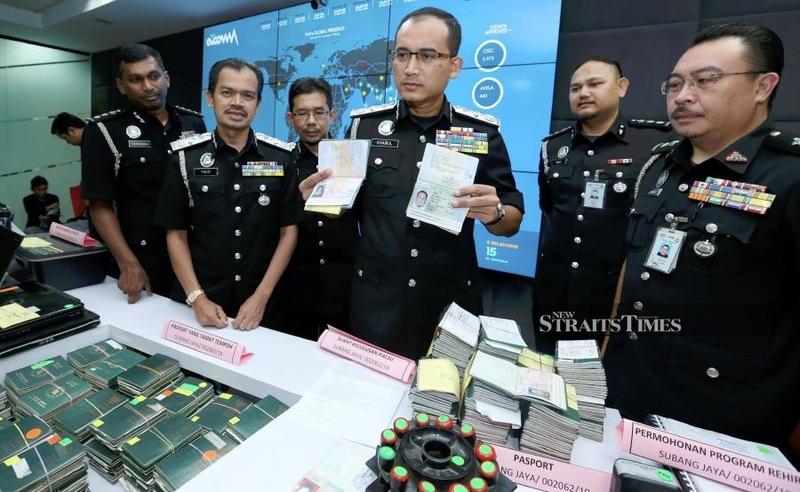 Its director-general Datuk Khairul Dzaimee Daud said in the first operation, his team raided a premises in Ampang on Tuesday and arrested eight Bangladesh nationals. The syndicate, known as Bangraj,has been in operation for more than three years. “We seized 110 Bangladesh passports, with three of them being fake, and several other items including three laptops and a printer,” he told reporters today. In the second raid in Subang Jaya on Wednesday, Khairul said the department confiscated 1,040 passports. Most of them were Bangladesh passports. “We have detained nine Bangladeshis and a local. The local suspect is not a civil servant.” he added. The second syndicate, he said, had been operating between five and six years. Asked how much these syndicates would charge for the fake stickers, the director-general said it could go as high as RM3,000. Khairul warned of more action against those involved in forging documents such as visa, permit or pass. “Under Section 55D of the Immigration Act 1959/63, they can be fined not less than RM30,000 and jailed not less than five years but not more than 10 years. They also can be whipped not more than six strokes,” he said, adding that the Immigration Department had conducted 3,163 operations between Jan 1 and March 6. There were 1.8 million foreign workers in Malaysia to date.